Being in the home stretch of my tenure at Billboard, it was a pleasure to take time to review one of my favorite bands, MAE. I will admit that I had mixed expectations about this show. As a big fan of MAE and their unique brand of indie alternative rock since their first album (the 2003 release Destination: Beautiful) I was not as impressed with newer material off their latest release. 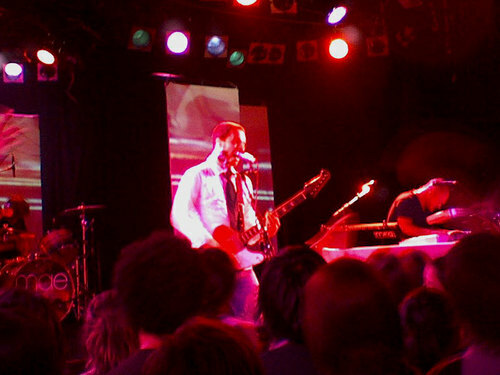 Their major label debut with Capitol, Singularity, had the band experimenting with “harder” songs. This was a departure from their early lighter, piano driven tracks. 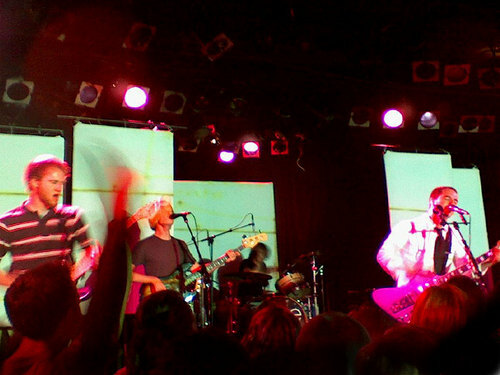 This tour aimed for smaller clubs as oppose to the bigger theater venues the band has played their last few stops in Los Angeles. 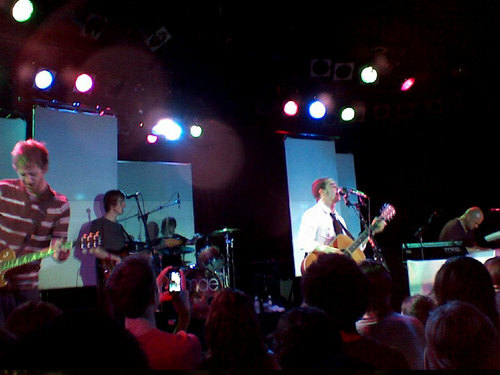 So, despite being a sold out show, the size of the Roxy was still an intimate setting for the concert. And although confined to a small club, MAE did not slack in their performance. 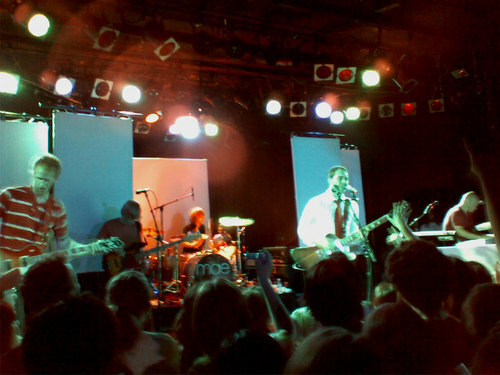 As the curtains raised and the band kicked into “Brink of Disaster”, behind them were several white screens set up with lights and video projected at the stage with images of space and lights, time lapsed video of acts of nature, and other beautiful accompanying images. With the new album fresh in the market and fans still familiarizing themselves with the new tunes, MAE mixed it up with a taste of their whole catalog inserting new songs between the classics. The crowd, comprised mostly of high school and college aged kids, did not seem as upbeat as expected, with the exception of the front and middle section of the floor, jumping up and down, raising their arms, and singing along with most of the songs like “Suspension” and “Anything” from The Everglow album. This included yours truly. It was not close to a rowdy or unruly crowd either, as MAE’s music is not the type to incite major pushing, mosh pits, and crowd surfing. Think of it as The Fray with better musical styling and distorted guitars. Lead singer Dave Elkins was spot on with most vocals, struggling to be heard with some lower vocal parts. His somewhat nasally vocals on catchy melodies are soothing and calming without inducing sleep. His energy when playing comes across very well, and with the lighting and projections he looked very cool with the graininess of images projecting off his face while performing. His use of a vocoder on some newer songs was an interesting effect, but take away from what makes his voice so great. Drummer Jacob Marshall has always impressed me with big drum parts heavy on the toms and bass drum that bring an epic feel to MAE’s songs. It was also his birthday, which the band celebrated by taking shots in the middle of the set. Keyboardist Rob Sweitzer is probably the second most stand out piece of the band next to Elkins’ unmistaken vocals. This is not because of his resemblance to Michael “The Thing”, “The Commish”, “The Shield” Chiklis, but for beautifully composed piano lines. The one-two punch of his keys with Elkins’ voice spark the concept that rock music can be beautiful. Bassist Mark Padgett seemed bored at times, or at least not as energetic as the rest of the band and guitarist Zach Gehring, who contributes a mix of whimsical picking and distorted strumming was into the set, but couldn’t crack a smile. With a band that makes happy music, they could at least show some extra emotion on stage. The ever-changing lighting and video effects perfectly matched the tone of songs such as “The Ocean” with blue images pulsating and birds flying. Perfect for the song’s theme of contemplation and searching. A four-song blitz of newer tracks featuring “Just Let Go”, “Waiting”, “Rocket”, and “Sometimes I Can’t Make It Alone” featured flashes of the scribble artwork on Singularity’s cover. The scribbles are meant to be a visual representation of singularity. 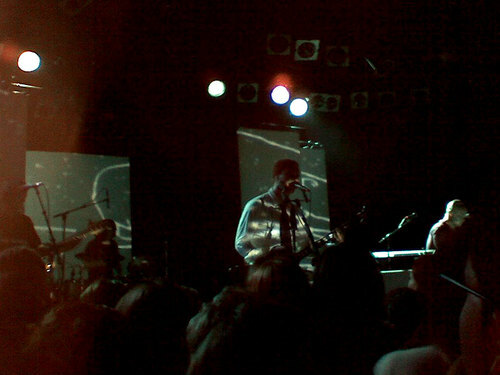 Psychedelic light beams on the latter song matched the theme of its accompanying music video, which just premiered this week as well. 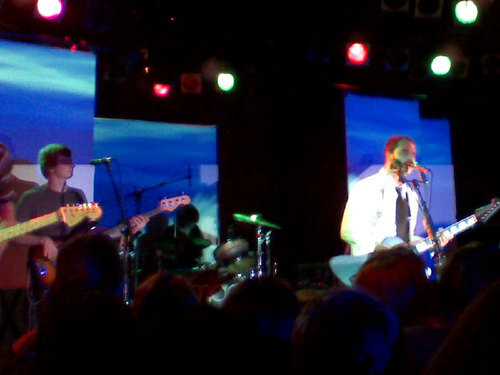 After closing their set with their very first single “Summertime”, the fans demanded an encore immediately. The tease did not last long, as the moment they walked off stage, a guitar tech ran out a moment later to tune an acoustic guitar. Lead singer Elkins returned to the stage by himself offering up another old song, going into the acoustic version of “Sun” off their Destination: B-Sides EP. This version is almost superior to the original. Again, this is thanks to the stripped down aspect where Elkins’ vocals shine and breathtaking piano parts from Sweitzer as the band came back on stage one-by-one and joined in by the 2nd verse not missing a beat. 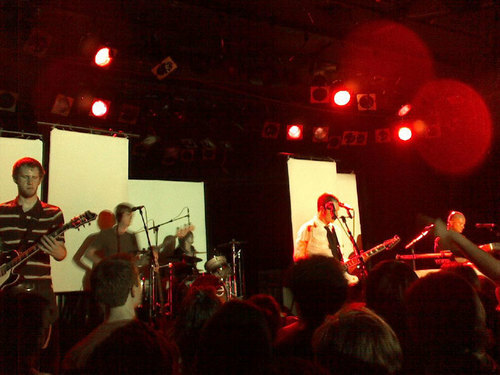 The final song performed was “Someone Else’s Arms”, their last independent single release from The Everglow. Ironically, the projection theme of their stage act is very reminiscent for the video of that song. Closing it off with a big sing along with the crowd, the band even took an extra few minutes to high-five and throw out guitar picks to the crowd, a gesture not often seen from bands nowadays. Based on past experiences I’ve had seeing MAE live? I was let down at the fact that they only played a one-hour set. Seeing they gave an astounding 90 minute performance two years ago at the El Rey Theater without big screens and projections. With so many good songs, it is difficult to create a “perfect” setlist for this band. Based on tonight? It was an impressive performance. For a band whose name stands for Multi-sensory Aesthetic Experience, they proved just that! The sound mix was perfect with the band practically never missing a beat. The screens and projections were perfectly orchestrated to match the flow of the set with compelling images and lighting effects. Lead singer Dave Elkins who is criticized for being inconsistent with his vocals, either has deaf critics or I caught them on a good night as his vocals were either spot on or perfectly acceptable. My personal bias aside, this is a band that should be checked out if you haven’t heard them yet. With the backing of a major label, they will definitely be heard more on Adult Alternative radio, but don’t mistake them for some cheesy indie rock wannabes. MAE have been making waves on the independent scene for 4 years now, and hopefully they beautiful, easily adaptable tunes will reach out to a new audience at shows. Yay I love Mae! I'm glad they played some of their classics from Destination: Beautiful. Summertime and Embers and Envelopes are amazing songs and very listener-friendly for those who are thinking of giving Mae a try. I'm jealous that you got to see them at the Roxy! Sounds like it was a great time overall, especially since Mae usually delivers a great show. AWESOME REVIEW! I LOVE IT! Soooooooooo good! I must agree that the band's new album is sub-par compared to previous works. Hopefully, tis only a phase they will surpass. Some of the new songs are good, and potentially, there are still many good songs to be written. They're performance looked like a fun thing to experience. I shall have to watch them in the future. Thank you for that in-depth and detailed review! I have to be honest I first wanted to skip this review. I've liked the other ones before but have not really heard of MAE and was not much interested. But I later I gave it some thought and give in. I am glad I did this is by far my most favorite of Lou dela Rosa's reviews. Your attention to detail was perfect and even though they are one of your favorite bands, you were still objective to their sound. I admired that you even indicated that this was not the best performance you've seen of them. After reading this in-depth and also easy read review I most give them a listen. Excellent job on covering this band.